JERUSALEM, Israel, December 23, 2010 (ENS) – About 50 miles from Bethlehem, the town where Jesus was born, scientists are drilling holes under the Dead Sea to determine climate and earthquake activity patterns in the Holy Land at the time of his birth. Scientists from eight nations are examining the Dead Sea’s seafloor by boring into the world’s deepest basin and drilling down 460 meters (1,500 feet) through layers of sedimentary rock deposited over hundreds of thousands of years. The International Continental Scientific Drilling Program, ICDP, brings together research teams from Israel, Japan, Norway, Switzerland, the United States and Germany. The team includes scientists from Tel Aviv University, the Israel Geological Survey and the Israel Academy of Sciences and Humanities as well as researchers from Jordan and the Palestinian Authority. Scientists and technicians of the GFZ German Research Centre for Geosciences in Potsdam have now completed a geophysical measurement procedure in the hole and helped with the initial examination of the sediment cores in a field laboratory. “We have drilled through about half a million years of sedimentary deposits,” estimates Dr. Ulrich Harms from the ICDP’s operational support group at the GFZ research center. “From this, we can deduce not only the climate history, but also the earthquake activity in this seismically very active region,” said Dr. Harms, who is working at the Dead Sea drilling site. Things have not always gone smoothly since November 18 when the drilling began onsite. A major storm on December 12 – the worst on the Dead Sea since 1980 – with extremely strong winds and sandstorms, disrupted research, bending and breaking drilling pipes and shifting the drilling rig. But even at this preliminary stage, some exciting finds have been reported. After drilling through hard clay, on December 6, the drilling crew penetrated wood, which they estimate was probably washed into the lake during a flood some 400,000 years ago. A salt lake bordering Jordan to the east and Israel and the West Bank to the west, the Dead Sea is located about an hour’s drive from Jerusalem. 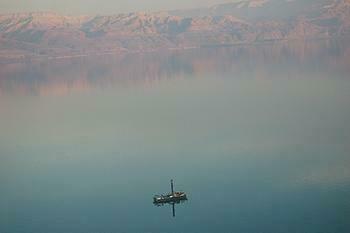 The rig is some eight kilometers (five miles) from shore in a place where the lake is 300 meters deep. The area is prone to earthquakes, which continue today. On December 11, there was a small earthquake, with a magnitude of 3.5, in the northern Dead Sea not far from the drilling site. 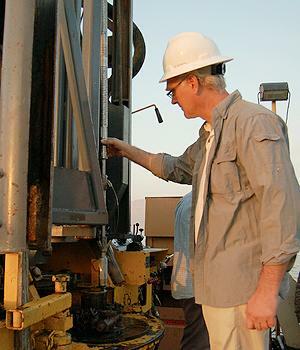 Although scientific drilling attempts to recover cores down the entire depth of a hole, it is not always possible, said Dr. Harms, although the direction and inclination of the well were determined with precision and the physical properties of the rocks were measured down to the bottom of the 460 meter deep borehole. 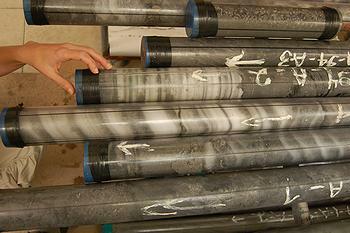 These unique measurements are used to record a continuous survey of the deposits in the Dead Sea and to compare the survey with the recovered cores. In addition, Dr. Harms explained, a second series of cores is being obtained from a second well in order to verify and secure the data. “If everything goes perfectly, we may soon be able to provide information about past climate and environmental changes in the Bethlehem area,” he said. “We believe that the results of this project will have vast implications in the fields of science and environment and will shed light on new natural resources,” Professor Tzvi Ben-Avraham of Tel Aviv University and Motti Stein of the Israel Geological Survey, said in a joint statement to the media in November. “A historic hydro-geological-environmental study of the Dead Sea will help unravel the mystery of human cultural evolution in this area,” said Ben-Avraham and Stein. Evidence of a severe weather pattern, or major earthquake could also indicate human migration in or out of the region. The region of the Holy Land is considered a land bridge across which early humans migrated in several waves from Africa to the north, said Professor Achim Brauer, a paleo-climatologist at the GFZ and one of the initiators of the drilling project, who is also working at the drilling site. Brauer and his team will use high-resolution scanning equipment to analyze the drill cores brought up from beneath the Dead Sea. Brauer says determining the climate history of the land of the Bible can reveal the characteristics of the climate at the time of Jesus’ birth and also the climate of the area across the entire scope of human history.